An invasion of dinghies and cruisers descended on the quiet bay at Barnageerah on Saturday 13th August 2016. This event had been organised by cruiser captain Kathryn Collins and, by all accounts, was a big success. 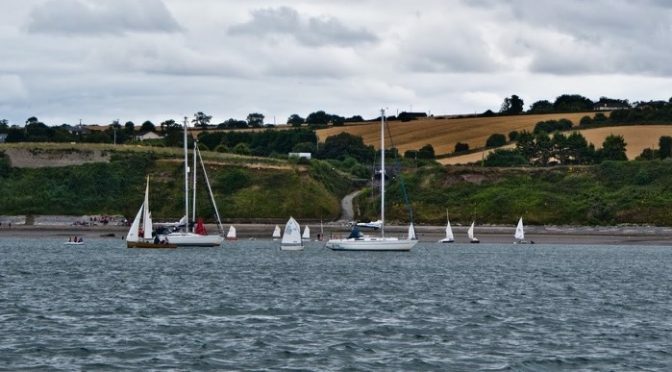 After sailing from the harbour many of the boats rounded St. Patrick’s Island before heading for Barnageeragh. Dinghies parked on the beach and some of the cruiser crews dined aboard their own boats. There was a great relaxed summery air about proceedings. Younger members had great fun both on the beach and messing around in their dinghies on the water. The whole event was well supervised by our wonderful volunteer rib crews. Later a BBQ in the club was very well attended and had a great family atmosphere. Photos by Kathryn Collins, Andrew Frazer and John Furlong.